I wasn’t expecting to actually like this book. Mystery has just never really been my thing. Although I’ve always seen the appeal of it, it’s just not a genre I come across often, and therefore haven’t read a lot of it. The plot…ah, so compelling! Obviously, this book is a mystery. It should be compelling. And the reader should always be kept guessing, but I didn’t expect it to be done so well. So amazingly. The characters…how perfect for YA! I guess here lies my problem with mystery books. I never thought I would be able to relate to, or like the characters. But Cavallaro proved me completely wrong. Being teenagers in a high school, they were relatable. They were likeable. They were perfect. The writing…was pretty damn spot on. 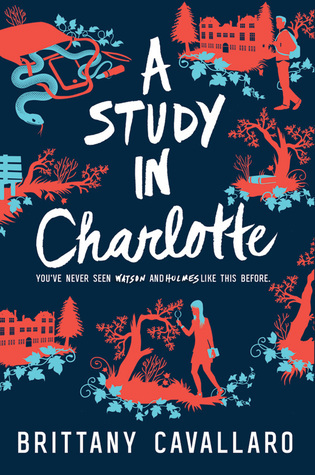 I don’t know how else to word it, but it suited the book down to a T. I felt both Holmes’ and Watson’s characters very strongly throughout the writing, even though most of the book was written from Watson’s POV. Something I liked…the setting. I don’t often point this out, but I think if it hadn’t have been set in a high school I just wouldn’t have related to it as much. Something I disliked…practically nothing. The only thing I can say would I would have liked more closeness between the two, and more expansion on their friendship. Yay! It’s a really great read! It was really good 🙂 I hope you like it was much as I did! I’ve been debating whether or not to TBR this book, but now I just might!